Hotel Jen Tanglin Singapore’s gorgeous all-day dining restaurant J65 is an ultimate gourmet paradise if you are keen on mainly local fare. Its wholesome Sunday Champagne brunch has left an impeccable impression and we are now equally enthralled by their latest launch of regional hawker-themed dinner buffets. J65 is fronted by Executive Chef Frederick Kho, a Malaysian native cook who specialises in homestyle Nonya, Peranakan and Straits dishes. Along with his talented kitchen crew, patrons can watch the A-team in action at the spacious open kitchen. Think tantalising local delights such as satays, kong bak pau, homemade popiahs, Penang hokkien mee and the list goes on. From now till Tuesday, 31 May 2016, quote “ladyironchef” to enjoy a scrumptious dinner buffet at only S$35++* per person (usual price from S$45++ to S$55++). Additionally, for those of you who celebrate your birthday at J65, you will receive a complimentary buffet plus a free three-tier stand of cupcakes and an over-the-top chocolate milkshake. Stop pinching yourself, the deal is real and it is valid from now till the end of 2016. Been meaning to travel around Asia but can’t find the time? No worries. 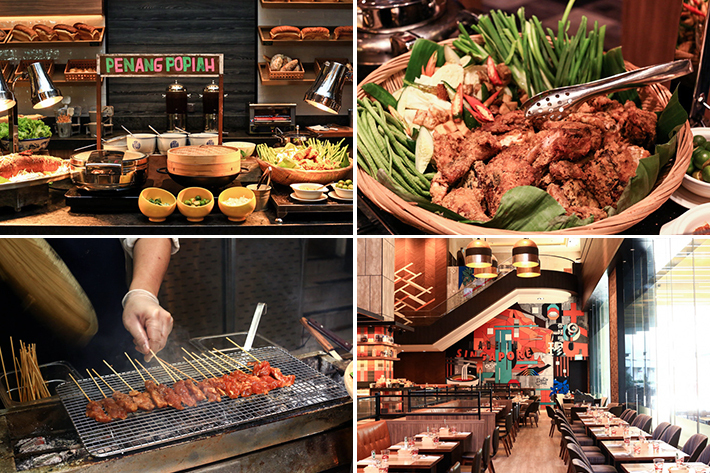 There is no need to fly when you have direct access to Asia’s best street food right at Hotel Jen Singapore’s J65. There is a star item every day of the week, and while buffet restaurants usually do “items on rotation” where you’d be left to play with luck and possibly be disappointed when your favourite item isn’t “on rotation” that day, J65 does it differently. No disappointment here. Just go on the days that has the dish you want to try/ like. Here goes – Kong Bak Pau and Duck Mee Sua on Mondays; Ayam Penyet and Penang Hokkien Mee on Tuesdays; Sup Ekor and Hakka Beef Noodles on Wednesdays; Claypot Pork Rice and Bak Chor Mee on Thursdays; Woodlands Bazarr Special Lamb Shank with Nasi Briyani and Penang Lor Mee on Fridays. The weekend features several Southeast Asian specialty choices too – Ayam Percik and Crispy Fish Noodles on Saturdays, and Nyonya Classic Ayam Pongteh and Curry Chicken Noodle on Sundays. We know what you are thinking. You are probably condemning the idea of eating hawker fare at a hotel buffet. But let us reiterate that on top of the (much more) comfortable and clean environment, the authenticity of these local food are unrivalled; J65′s team of experienced chefs have an impressive track record of preparing Southeast Asian delights. No efforts have been spared, and no corners have been cut in bringing you the most quality selection. More importantly, free flow of everything we like is always a wonderful idea. Then, there is the Asian Noodle Station, where you get to watch the chefs prepare a feast. The Singapore Chicken Rice and assorted roast meats are to die for, seriously! The head chef has a wealth of experience in roasting, and you bet those fragrant slabs of meat are worthy of all the calories you are about to gain. Sorry, what diet? If you think that is all with J65′s offer of Asian food, you are wrong. We are merely at the beginning of introducing the comprehensive variety. There’s Kueh Pie Tee at the DIY stand, or you can request for a freshly handcrafted crabmeat popiah and watch in awe as the chefs fold and roll your tasty snack. A DIY Rojak section will also be part of the line-up, and you know what this means? We get to toss as much pineapple and you tiao (dough fritters) as you want! We don’t know about you but we gave up hoping that our hawker-bought Rojak would have more pineapple chunks than bean sprouts. From Singapore-style crabs, everyone’s favourite salted egg yolk prawns to Tandoori chicken with naan; fresh sashimi to a whole bed of cold seafood on ice. We honestly doubt you can even try a bit of everything because the spread’s really huge. Ready for desserts? We promise you will feel like Charlie in the Chocolate Factory. Stuff yourselves silly with their chocolate cakes, cherry pistachio tarts, pina colada, Japanese mochis, brownies and whatnot. Fans of nyonya kuehs like we are? Yes, there is a whole platter and you should totally take one each. Of course, take more for your favourite one. Limitless kueh lapis for you? Of course, don’t forget to unleash your inner child at the ice cream station. Grab the ice cream in your favourite flavours, and pile on all the toppings you want. This sort of unadulterated fun is priceless, and was exactly what we yearned for the most when we were kids – just eat as much ice cream as you want, with as much chocolate rice/ gummy bears/ marshmallow etc. Celebrate your birthday during dinnertime at J65 with at least three other friends and you get to dine for free. On top of that, you will also receive a crazy chocolate brownie milkshake alongside a tier of frosted cupcakes. Seriously, how can your birthday not be awesome?! This offer is not in conjunction with other promotions, discounts and is subjected to restaurant’s availability. Quote ladyironchef to redeem this special offer of S$35++/pax for dinner buffet at J65. This promotion is valid from now until 31 May 2016. not valid for Mother’s Day weekend, eve of and on public holidays. This post was brought to you by Hotel Jen Tanglin Singapore. I checked earlier today (as it’s my birthday) and was told by one of the staff that it’s a slice of cake now, no three-tier stand and no milkshake any more even if your birthday falls on the day itself- so i think the promotion has ended. The prices have increased to $55 Sun-Thu as well.. Good for an update despite this being an older post?